Climb the straightforward glacier from Battleaxe Col, then the final few metres of rocky ridge to the summit. A short distance upstream of Sinclair Bivvy, follow a moraine crest to the line of bluffs running parallel to the valley below Bandit Peak. Move diagonally through the bluffs on snow slopes to reach the crest of the South West Ridge. Follow easy rock along the ridge to the summit. An alternative route on to the ridge exists at the northern end of the bluffs and crosses the glacier between Pt 2300 metres and Amazon Peak. 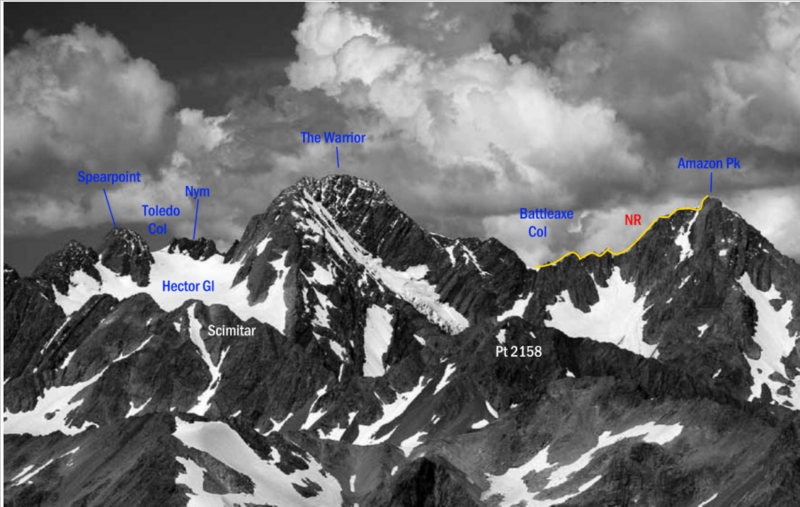 From the upper Sinclair River, follow a snow gully to Crossbow Saddle and then up the straightforward glacier to the final few metres of rock below the summit. A straightforward snow climb from the upper Kirk Glacier with a final short rocky scramble to the top.